Sometimes, a fashion designer getting the formal recognition they deserve comes long after the moment they first start making waves. 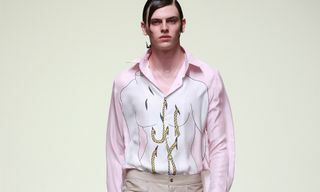 Many of them toil for years, gaining a name for themselves slowly, before arriving on the fashion week schedule. 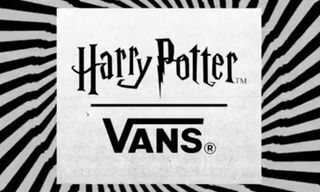 Others, however, struggle to find their feet: losing interest, money and notoriety at the same time. But we often forget that a designer’s slower path can be a conscious and a great thing; it has been for Alexandra Hackett. The Australia-born, London-based talent behind menswear label Studio ALCH has been known on Instagram for her one-off pieces for the past five years now. 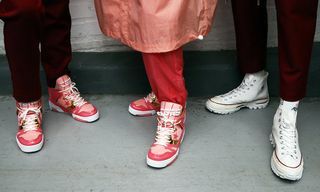 More often than not, the garments she’s making are re-appropriated versions of Nike staples – sport socks and duffle bags, in particular – shaped into dungarees, boiler suits and fishing gilets that have left streetwear-obsessives begging her in the comments for her to make more. The ubiquitous Nike swoosh (hence @miniswoosh, her Instagram handle) almost always plays a part in it. 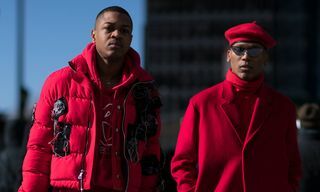 Her off-kilter way of creating these hyped pieces caught the eye of the rap and grime cognoscenti too: she’s created custom pieces for artists like Kendrick Lamar, Skepta and Stormzy in the past. @kendricklamar performing at Voodoo Fest, wearing ALCH custom Boiler Suit made from Reconstructed Nike bags. 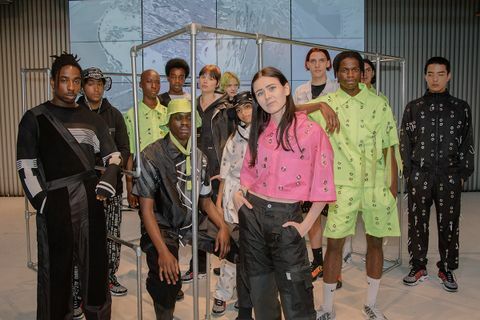 So it’s no surprise that her first showcase at London Fashion Week: Men’s stems from a tight-knit collaboration with Nike themselves – this time, with the brand’s seal of approval. 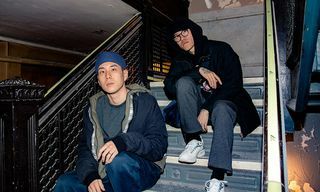 Presented in Nike’s 1948 space in East London, Studio ALCH’s SS19 collection was tied to the idea of hyper-functionality, and an old Japanese practice called Chindōgu that, according to the show notes, involves “inventing products that are not entirely useful, but simultaneously not useless”. Hackett’s first collection is more complex than traditional sportswear. 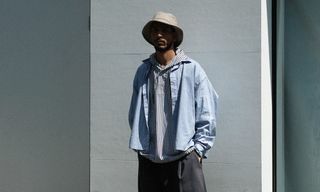 It takes familiar silhouettes – track jackets, bucket hats, sweatpants – and switches up the way each garment is constructed. 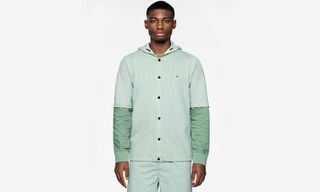 Full tracksuits are covered in dozens of gigantic eyelets, while shirt and shorts co-ords in both white and volt yellow are given a similar kind of treatment, laced with oversized ALCH tags. Bottoms are plastered with velcro panelling to make them more functional; perhaps a clue about the pieces that might be coming in future. And to top it all off: a link-up with Patta, who’ve entrusted Alexandra to turn one of their rucksacks into a utilitarian-style gilet. 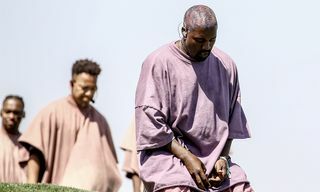 Quite whether that piece will reach retail, or be worn by one of the rap gods, remains to be seen. 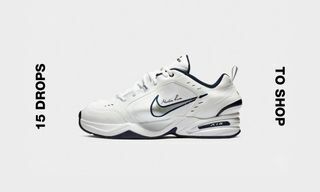 Unsurprisingly, the true stand-out pieces are the ones that tap into Hackett’s fascination with tearing up old Nike gear and breathing new and unusual life back into it. 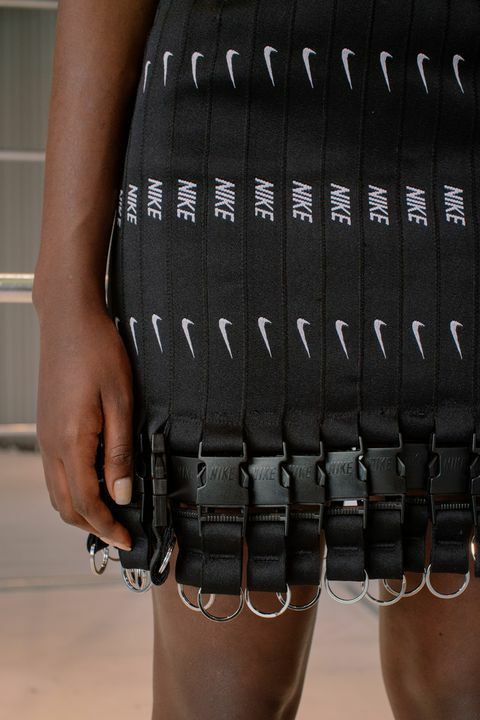 Black basketball-style shorts and a matching skirt are made entirely out of sewn together Nike lanyards, while mock neck sweaters are comprised of ALCH-branded ribbed sock-like cotton. 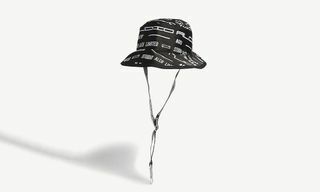 A duo of bucket hats made in a similar manner, with Studio ALCH fabrics instead, are also bound to be sell-outs when they drop at the beginning of 2019. 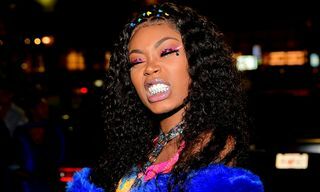 She’s always been an innovator; never one to take one idea and run with it or deliver the same stuff with each impromptu (and super limited) drop on the Studio ALCH site. Right now it’s these bold and inventive Nike collabs that have caused Hackett’s brand to catch attention, but the most exciting thing about this designer is trying to predict what path she’ll take next. 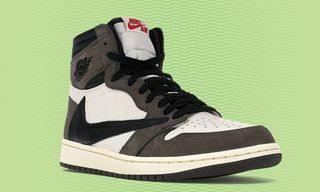 After all, with co-signs like the ones she carries now, this SS19 collection could, and should, be the first of many – whether she sticks by Nike’s side or not. 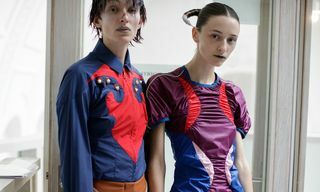 For more from LFW:M, check out Kiko Kostadinov’s SS19 presentation from the British capital.